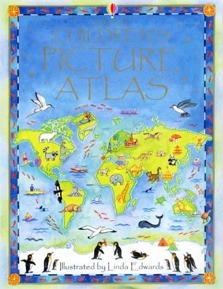 A beautifully illustrated picture atlas that takes children on a magical journey around the world. Each map is crammed with fascinating details to pore over and talk about and thematic pages describe people and places around the world. Includes a ‘Trip Around the World’ quiz and an index of place names. From Mayan temples in Mexico to albatross in Antarctica, you can explore the four corners of the globe while still tucked up in bed. The maps here provide the perfect inspiration to would-be adventurers. Geography: children can find it boring, right? Well, not if they have this picture atlas, which takes readers on a cartoon-illustrated tour of the world, cramming lots of child-friendly facts on the thematically organised pages.